The Make it Monday Challenge this week is to add colour to stamped images. The Morning by Morning stamp set seemed to be an excellent stamp set for trying out this technique. Adding Prismacolor pencils in similar but darker shades and then blending with Gamsol, brought a new level of depth to the leaves and flowers. The effect is subtle and yet somehow dramatic. I will definitely be trying out this technique again. Supplies: Papertrey Ink Morning by Morning stamp set, Prismacolor pencils, Gamsol, Simon Says Stamp dye inks and cardbase and Scor tape. This week’s Monday Challenge at Simon Says Stamp has a theme of Winter Wonderland. Well, after a slow start to winter here in Calgary, Alberta, we are now in the middle of a Winter Wonderland. I like well behaved winter wonderlands………….that is where the snow just falls in the yards and in the mountains and in the forests and NOT on the roads and especially NOT on my driveway. But winter wonderlands are like unruly teenagers………….they rarely do what you request and yet you still love them. I wanted to make something with my Snow Gear stamp set that I got recently for an amazing sale price from Simon Says Stamp. Specifically, I wanted to make something with the toque and goggles. But wait………..first I need to know something………………..I have heard that only Canadians use the term “toque”………………..so my question is……………….what does everybody else call those ridiculous knitted hats with even more ridiculous looking pom poms stuck on top, if you don’t call them toques? The second question for me was, “How do I use a toque and goggles all by themselves?” Even in Canada, toques are usually grounded by a head, no walking dead toques here. So I decided to find something to put the toque and goggles on. And don’t you know, I found something that they fit. Then I decided to add the snowboard even though the crossed skis would be more representative of my skill level on the ski hill. I made texture paste snow flakes and added Distress Glitter. I then spilled half the bottle of Distress Glitter on my velvet leggings I was wearing. You don’t have to do this part, but if you do………….you are all glitzed up for New Year’s Eve. Supplies: Simon Says Stamp Snow Gear stamp set, Simon Says Stamp Stitched Slopes and Hills die, Simon Says Stamp Winter die, Recollections and Neenah cardstock, Copic Markers, Pico Irresistible Embellisher in Clear, Liquid Applique, Ranger Texture Paste, Distress Glitter, Simon Says Stammp card base and Scor tape. My beautiful niece Kaitlin is marrying her very own Prince Charming Matt very soon in the real life setting of the movie Frozen! In a few days we will be heading out to the fairy tale setting known as Jasper Park Lodge in Jasper, Alberta for the event. What could be more quintessentially Canadian than a hockey net and Adirondack chairs set in the snowbank around the fully utilized pool! Supplies: Stampin Up A Beautiful Ride stamp set, Papertrey Ink Warm Winter Wishes stamp set, Simon Says Stamp Stitched Slopes and Hills and Winter dies, Lawn Fawn Snowy Day patterned 6 X 6 paper pad, Neenah Solar White cardstock, Perfect Pearls, Pico Irresistible Wedding Dress and Shimmer embellisher, Copic markers, Simon Says Stamp Card base and Scor tape. Here is the sketch for the current My Favorite Things Challenge. Here is what I decided to do with the sketch. Supplies: My Favorite Things Soda Pop stamp set and dies, My Favorite Things Abstract Art stamp set, Kaisercraft Base Coat patterned paper, unknown woodgrain paper, Copic markers, Pico Irresistible Embellisher in Shimmer, Simon Says Stamp card base, Tombow adhesive and Scor Tape. Recollections white embossing powder and Versamark Ink. I thought I would do a quick entry for the Papertrey Ink Blog Hop Challenge. The card turned out pretty well but did not photograph particularly well. Must have ate too much turkey and it affected my photography skills! The Challenge theme at Impression Obsession is “Snowy”. Of course, I have a new die from Impression Obsession I wanted to use. I liked this die so much I apparently ordered it 3 times. I have ordered the same thing twice before, but three times is a record even for me. Lucky for me, it was just a little die for not very much money, so I didn’t feel the need to hang myself over it. My friends, Sandra and Kim received an early Christmas present from me, to get rid of the evidence. Supplies: Impression Obsession 335-A (times three!) and 122-R dies, Pebbles and Bo Bunny patterned paper, Simon says Stamp card base, 3M foam tape, acetate and Scor tape. I should be wrapping gifts, cleaning the house, doing some baking, getting ready to go to my hair appointment, but am I doing any of this……………………no I am making a card for the Wednesday Challenge. I decided to use my recently acquired Poinsettia Parade die. I had only used it once so far and what I made is in the “uncompleted” basket. This usually means that the card is not ugly enough to throw out, but not pretty enough to actually use. I guess I am hoping that some card fairy godmother comes along and transforms it into a pretty card when I am not looking. …………………….Hmmmmmm it is still in the basket……………..guess the card fairy is busy this time of year. Anyway, this one turned out much better………………………. Recently, I received some Happy Mail from Pretty Cute Stamps. One of the sets was the Gingerbread House. I was wondering how I could use it just by itself, without adding some Gingerbread people to the scene. I decided it might look nice if it was painted in quite intense colours. I am always looking to use something that I have that might be considered “collecting dust” in my stash. My Wink of Stella Glitter pens fit this criteria. Not the Clear one, of course; I think I have painted my way through four of them so far, but all the other colours, that I thought I needed as well. I actually like the result. It is both intensely coloured and glittery. These pens are not easy to paint with (other than the clear one), so for me, it is a triumph to have a “keeper” painted with them. I covered the gumdrops in Pico Embellisher in Shimmer and the roof in Pico Embellisher Wedding Dress. 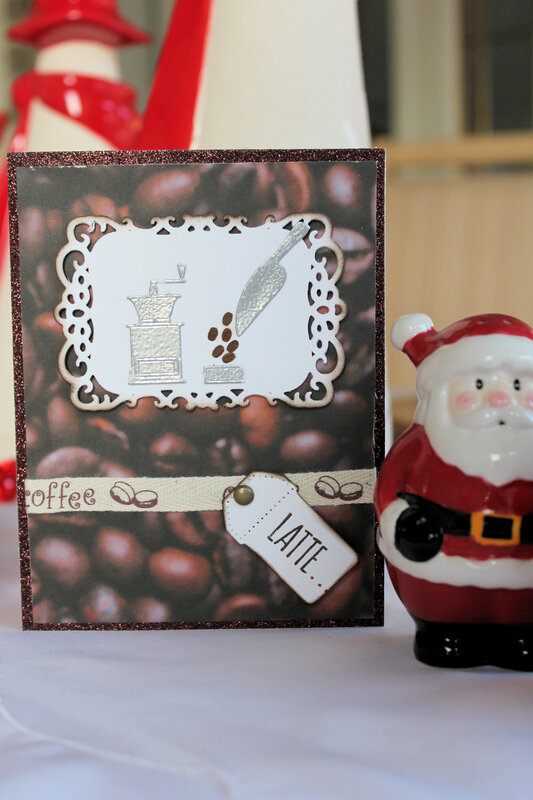 The whole card is one layer and easy to mail while still having a bit of a WOW factor. I admit to not knowing exactly what the Holiday Coffee Lovers Blog is all about. I was browsing Pretty Cute Stamps and saw that they were one of 49 sponsors, sponsoring this blog hop. What more incentive does anyone need. 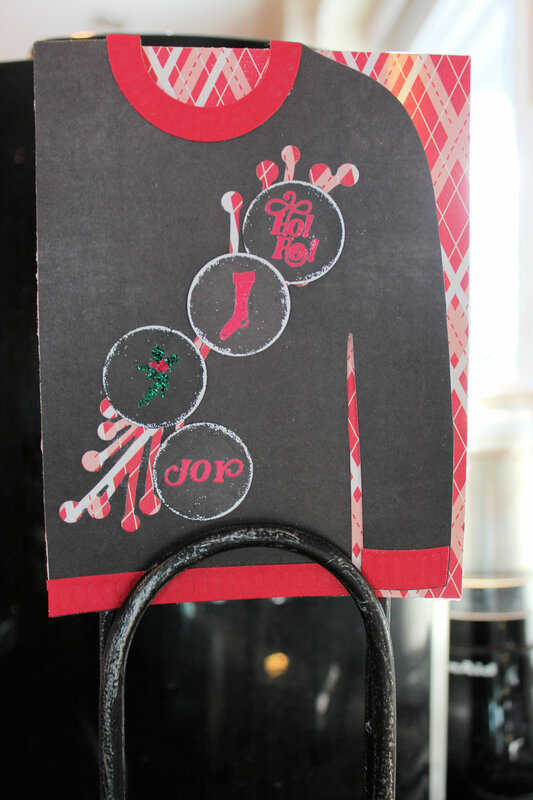 The inside of the card continues from the “Latte” on the front and says………………..well actually will say………… “Warm Holiday Wishes”. This stamp must currently be on a “Coffee Break” because I can’t find it among my Christmas supplies at the moment.